It goes without saying that a lightweight sweater is a fall staple. While sweater styles do change subtly, there are only so many ways you can knit a sweater. 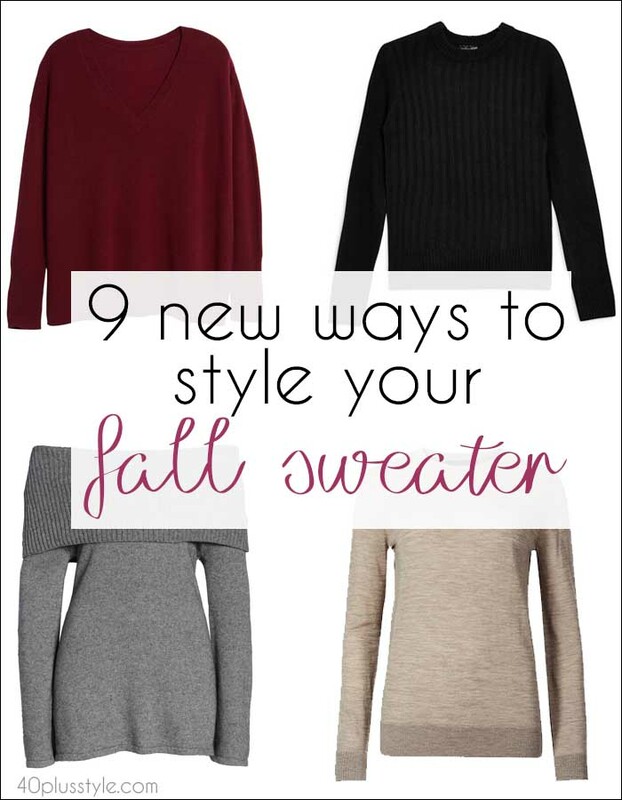 But, there are lots of different ways you can style a sweater. 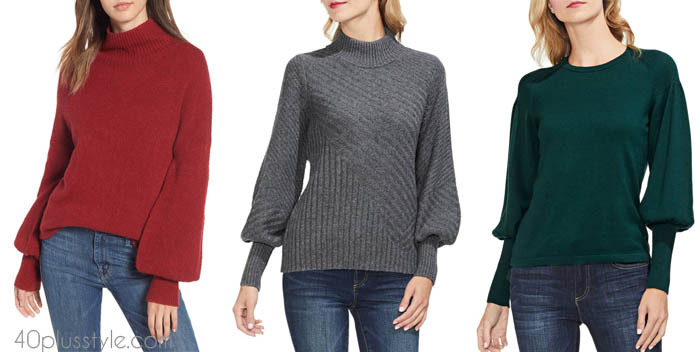 Here are some of the best sweaters for women and ways to style them this fall. Who says you have to give up neutrals when colder weather sets in? An all-neutral look can still look chic for fall and winter. It tends to work best if you choose a creamier white rather than a shade which is too stark. While there are some beautiful richly-hued jewel colors among the fall color trends for 2018, whites, creams, camels and pale grays can also look stunning when looking at sweaters for women in stores, or shopping your closet. They can create real impact when worn together. Just as the half-tuck became the fashionable way of tucking a shirt this summer, the sweater has also gained a tuck and is a new idea when looking at how to wear a sweater. Wear yours tucked in a little at the front and then left casually to drape at the side and back. However, you may wish to avoid this kind of tuck if you don’t want to add extra bulk around your midriff. It’s all about playing with the tuck so that your sweater falls in the most flattering way for your body shape. Push up your sleeves for an even more relaxed take on this trend. If you have a print skirt in your closet, you can style it for fall with a sweater in a block color. Again, play around with where your sweater falls to make sure it ends at the most flattering part on your body. While most sweaters for women tend to come in one block color, there are some unusual prints out there which will make your sweater a hero piece for fall. Trends tend to be all about those little tweaks. We’ve had cold shoulder tops and voluminous sleeves during spring and summer. Now, the latest jumper style is the bell-sleeved sweater. If you do decide to try it, it’s likely to be a women’s sweater trend which won’t be around too long, so simply choose something you love for this season. This is another time you need to think about proportions and what will work best for your body type. The point where the bell shape ends on the sleeve draws the eye. so, the green sweater below draws attention to the waist, while the red sweater draws the eye to the hips. Find one which is flattering for you. A plaid blazer is a huge trend for fall 2018. It’s a great look for weekends worn with a sweater underneath. You’ll want to choose a sweater which is lightweight so you don’t add too much bulk. A cozy sweater can be a soft, glamorous option with a pleated evening skirt. You could opt for a more casual sweater style and sneakers for daywear, or choose an off-the-shoulder number for an evening out. To stay warm AND stylish, you could layer your sweater with other knits. A turtleneck is a great layering option to wear under a poncho. Again, a turtleneck is put to good use as a layering option. Victoria Beckham has been layering hers under a shirt dress. It means you can continue wearing a thinner dress for fall and winter. Team yours with knee-high boots. How will you be wearing your sweater this fall? 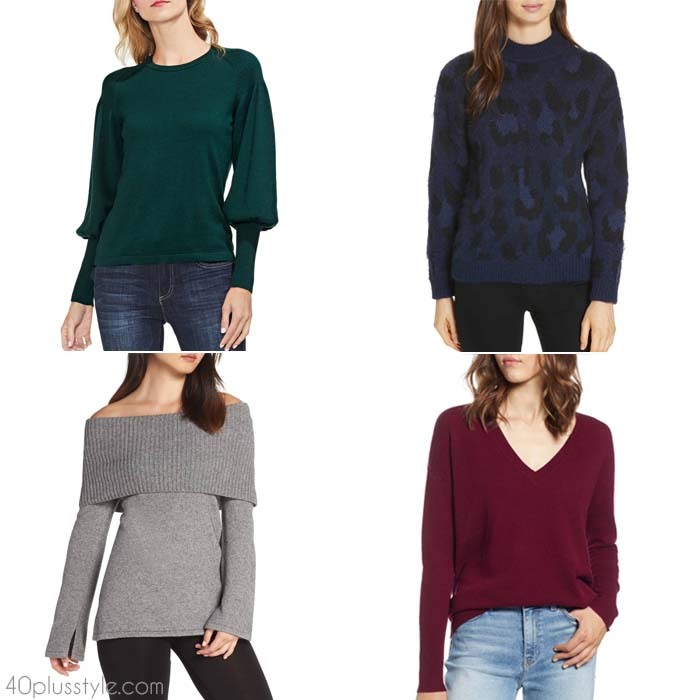 Have these sweaters for women ideas on how to wear a sweater given you some inspiration? Previous post: The best cocktail dresses in stores now – what do you think of number #5?